97 Points and just $14.99 per bottle. One day only. 97 Points and just $14.99 per bottle on sale! 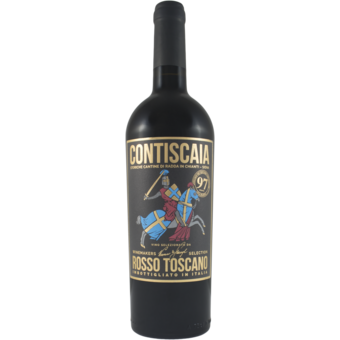 A ridiculously smooth blend of Sangiovese, Cabernet Sauvignon and Merlot, the 2016 Contiscaia Toscana Rosso IGT "Winemakers" Selection is a total knock out. 97 Points and just $14.99 per bottle on sale. This will be one of our biggest selling wines of 2018. Period. This one is about as big of a no-brainer as you will see. A ridiculously smooth blend of Sangiovese, Cabernet Sauvignon and Merlot, the 2016 Contiscaia Toscana Rosso IGT "Winemakers" Selection is a total knock out. How often will you see a wine like this ... with this kind of press ... in this price point???? Our team was totally blown away when we tasted this for the first time. If there is ever a wine to showcase just how good a wine can be ... for $14.99 ... this is it. Once you taste it yourself ... you will see what we mean!! Watch the video below as both Sasha and Gary Vaynerchuk taste and discuss the Contiscaia we are offering out today! It will be that one red wine many of you will remember for years and years to come. That one bottle you found, that for $14.99 per bottle on sale, delivered so much pleasure, so much discussion, so much ... flat out ... bang for your buck. These are the kind of wines we look for day after day and when the year comes to an end, we can always look back and point to a small handful of wines that, for under $20, is just truly amazing. This year ... there will just be one that stands above the rest ... and there is no question that it's going to be the Contiscaia. *** Buy a case for yourself. *** Buy a case to have around the house as the ultimate pasta or pizza wine. *** Grab some to bring to your local BYOB. *** Stock up and use as client gifts or gift ideas for friends or family this holiday. *** Grab a bottle, stick it in a blind tasting with other $50-$75 wines ... and watch what happens! This is going to blow people away!!! Whatever you decide, this is worth every penny and so much more!!!!! Use the code CWS2016 and the shipping on all orders of 12+ bottles will be free! Please note, this free shipping deal is valid today only so grab it while it lasts! !